One of the most awkward subjects for many of us to discuss is our personal finances. Even though our personal financial health directly impacts our family, our local church, funding for international missions, and our opportunities to be able to dedicate time to volunteer with ministries that matter to us, we hesitate to understand how to be stewards of the money the Lord entrusts to us. Money is a useful tool, but a terrible god. We can use it to glorify the Lord, or we can mistakenly worship it and believe the false promise that money can fulfill the deepest longings of our soul. But money can't fill that void. Only Christ can. We are called to be content in Christ and love one another so we don't become lovers of money. Instead of worshipping money, Scripture teaches us to be generous and careful stewards of the money the Lord entrusts to us. Doing so brings glory to Him, benefit to us, and benefit to those we love. With that in mind, let me suggest six principals that I believe followers of Christ should consider when stewarding the finances that the Lord temporarily entrusts to their care. I'm not a financial adviser, so you'll need to make your own decisions and do your own research regarding these principals, but these are the principals I'm following and I believe they have been an immense help to me and my family. 1. GENEROUS GIVING: When considering how to steward our finances, I think we should start with generosity. Let’s set aside the first portion of what the Lord blesses us with to give back to Him as an act of worship. In our household, we make certain to give at least 10% of what the Lord has blessed us with. That money is donated to the local church as an act of worship toward the Lord. On top of that, we also support other ministries while remaining open to the Lord's prompting to show generosity toward the people He has placed in our lives. Following this principal has been immensely helpful to us. It teaches us not to selfishly hold onto the Lord's blessings in an unhealthy or ungodly way. Before we pay our bills or invest a penny, we have learned to joyfully give a portion of what we've earned over to the Lord for His use. 2. DEBT AVOIDING: American culture is practically addicted to consumer debt. We're convinced that we need it. We're always talking about the importance of building up credit so we can be approved to accumulate even more debt. We incur debt on our credit cards, through student loans, through auto loans, and more. Even churches and church leaders often struggle with accumulating debt, partly because no one has ever challenged them to reconsider doing so. If you can decide not to take on any new debt while also systematically working toward getting rid of the debt you have, you'll gradually relieve yourself of an unhealthy financial burden. Do you need a $25,000 loan to buy a new car or is it possible to pay cash for a $4,000 used vehicle that can last for multiple years? (By the way, exactly seven years ago today I paid off the loan I had on my car and I'm still driving it.) It's my goal to never borrow for another car again because I've learned it isn't necessary, provided that I'm willing to plan ahead and save for it. It's much easier to do that now that I don't have consumer debt dragging my finances down like I used to. 3. SMART EARNING: How many sources of income do you have? For most people, the answer to that question is "one." I think it's good to start with one, but over time, it's wise to look into other ways to earn money that don't require you to trade "hours for dollars." In fact, I recently heard that most people who get ahead financially tend to have up to seven sources of income from both passive and active sources. So how can we earn extra income in addition to our primary jobs? Let me suggest several ways including; the creation of intellectual property, royalty income, rental income, side-gig/hobby income, and investment interest. I bring up those sources of income because I have personally benefitted from each of them. I think it's unwise to spend your entire life hoping your boss is going to give you a raise. Give yourself a raise by developing additional income streams. I also think it's unwise to have just one income source because if that source dries up, you'll be in a very difficult spot. What sources of income have you explored in addition to your primary job? 4. LEAN LIVING: Keeping a budget is wise at every age. My kids are currently in their teens and I recommend that they budget their money like this: 10% giving, 20% spending, and 70% saving/investing. They have been following this system while consistently working at one or two jobs each, and their financial reserves have allowed them to pay cash for cars, tuition, and other expenses. For adults, I recommend: 10% giving, 20% saving/investing, and up to 70% for expenses/spending (if necessary). We all tend to have a weak spot where we're likely to waste some money. For me, it's going out to eat. Where are you most often tempted to waste money? How often do you review your expenses to see if you can save some money? Are you ever using purchases to try to fill an emotional void? If you don't need to spend money, don't. You don't need to fill your home with more clutter. You don't need to buy new clothing every week. Keep your budget lean so your finances won't inadvertently be wasted. 5. EQUITY BUILDING: I'm not a fan of debt, but I do think it's wise for most people to eventually own some real-estate that they can build equity in, and a mortgage might be required for that to happen. At present, I have a mortgage, but if I don't experience any emergencies or financial interruptions, I expect to have it completely paid off within the next 38 months. When my mortgage is paid in full, I intend to use the money I have been allocating toward it to increase my giving, make additional investments, and build my retirement savings at a faster rate. If you need to obtain a mortgage to buy a home, there are multiple ways to do so, but there is one approach that, in my opinion, beats the rest. It's best to obtain a 15-year fixed rate mortgage with a 20% down payment. This will allow you to avoid paying Private Mortgage Insurance each month (or a Mortgage Insurance Premium), and it will always guarantee that you're paying more toward the principal than you are toward interest. It also guarantees that your rate won't change when lending rates adjust. For most people, this is the quickest approach to owning a home, free and clear. What kind of impact would having a "paid for" property make on your finances? What kind of ministry opportunities could you say "yes" to that you currently cannot? 6. WISE INVESTING: In my opinion, it's wiser to invest for the future than to sit around and hope the government is going to meet our financial needs when our working years conclude. Maybe your faith in the government is stronger than mine, but I'm not going to count on them to pay my bills or expenses when I'm no longer able to work. So what do you think about financial stewardship? Would the system I'm following be helpful to you or is there another approach you prefer? Are these areas that you think Christians should be discussing more for the sake of the financial health of our families and churches? I think so. Please let me know your thoughts in the comment area below. 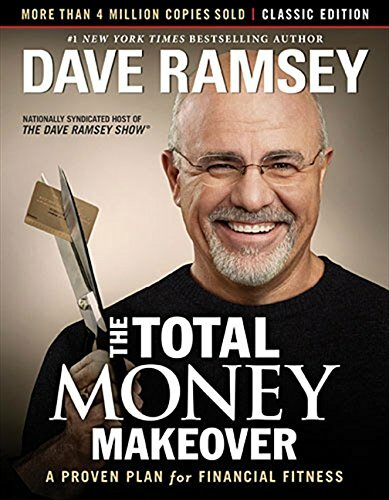 Also, if you're new to managing personal finances, I would recommend reading Dave Ramsey's book, "The Total Money Makeover." It's a great resource and the system he recommends has helped many people get out of debt while preparing for retirement. Some of the saving/spending percentages he recommends are slightly different from what I use, but they're pretty close. Newer PostWhat will you do with what you've been given? Older PostWhat will self-righteousness cost me?